Border malaria in the Greater Mekong region of Southeast Asia poses a serious threat to the health of the ethnic minority populations of the region. Traditionally thought to be caused primarily by the malaria parasites Plasmodium falciparum and Plasmodium vivax, recently a zoonotic parasite, Plasmodium knowlesi, has been identified in some countries of the region. The presence of this parasite poses a challenge to malaria control programmes, as it is maintained in a zoonotic reservoir of forest-dwelling macaque monkeys. A cross-sectional malaria parasite species prevalence survey was conducted along the Laos-Vietnam border in the central part of the two countries. Human blood samples were collected from Savannakhet in Laos and Quang Tri in Vietnam between August and October 2010 and assayed for the presence of human malaria parasite species and P. knowlesi. A PCR targeting the 18S small subunit ribosomal RNA gene and circumsporozoite protein gene was used for Plasmodium species identification. Nine cases of P. knowlesi were detected by PCR in blood samples from the Laos side and three from the Vietnam side. All P. knowlesi infections were found in co-infection with P. vivax, with some triple infections of P. knowlesi, P. vivax and P. falciparum detected in Laos. Phylogenetic analysis of these parasites suggests that P. knowlesi is circulating in the Laos-Vietnam border region. This report shows that P. knowlesi is transmited on both sides of the Vietnam-Laos border. Continued monitoring of the range and prevalence of P. knowlesi on both the sides of Laos-Vietnam border is of importance to the National Malaria Control Programmes of both countries. Malaria transmission in the Greater Mekong region of Southeast Asia is characterised by the spread of the parasite among people residing near, or travelling across, the numerous borders between the six countries of the region in which malaria is endemic. Often termed “border malaria”, it is characterised by transmission among and between diverse, often forest dwelling, and ethnic minority groups and may have a sylvatic component. Recently, numerous reports have documented the occurrence of infections among the human population in this region of the zoonotic malaria species, Plasmodium knowlesi, a parasite that naturally infects the Cercopithecinae Old World monkey species Macaca fascicularis, and Macaca nemestrina [1–5]. It is possible that the parasite is transmitted to humans in this region through the bites of the leucosphyrus group of anopheline mosquitoes, known vectors of both human and non-human primate malaria [6–11]. The heavily forested border area between Laos and Vietnam is home to various ethnic minority peoples . These peoples engage in many forest activities as part of their way of life, mainly swidden agriculture (slash-and-burn farming), hunting and foraging. Frequent and prolonged forays into forested areas increase the risk of sylvatic and zoonotic malaria infections among these groups. In Laos, a recent case of P. knowlesi in a human has been reported from Attapeu province, near the Cambodia border . However, the extent of the risk posed by P. knowlesi to humans in this region has not been addressed. The neighbouring country of Vietnam has previously reported the infection of people with P. knowlesi parasites , and, as the border area between Laos and Vietnam may act as a conduit for the transmission of malaria parasites between groups of people, monkeys and mosquitoes, it is conceivable that the parasite might be circulating in the border region, and so may pose a risk to the population of Laos. A cross-sectional survey for malaria infection was conducted between Savannakhet, Laos and Quang Tri, Vietnam, between August and October 2010 in order to evaluate malaria parasite prevalence along the border . Detailed information regarding study sites, populations surveyed, methodology of sample collection and ethics review have been published elsewhere . All adult volunteers provided informed consent and for children, and consent was obtained from close relatives. Human sample analysis was approved by the ethics committee of the Institute of Tropical Medicine, Nagasaki University (10121662-5). Active case detection (ACD) was conducted during the survey in 400 randomly selected households from 22 villages on the Vietnam side and from 14 villages on the Laos side. The Laotian and Vietnamese villages are separated by a shallow river around 50-m wide and are surrounded by forested mountains. A small number of villagers keep young macaque monkeys caught in the nearby forest as pets. The people that live in this region, on both sides of the border, are a minority ethnic group known as the Van Kieu in Vietnamese  and the Tri in Lao, who have special permission from the governments of Laos and Vietnam to freely cross the border. The samples used in this study were collected as previously described . A total of 3059 samples (Laos, 1256; Vietnam, 1803) were analysed by microscopy for the presence of malaria parasites (Table 1). Questionnaires were used to collect information such as addresses, medical examination results and treatment records, and blood was collected by finger-prick; thick blood films were made for microscopy, and blood was applied to filter paper for molecular analyses. Blood smears were examined by local microscopists at the provincial malaria laboratories of each country and then crosschecked. Each blood-spotted filter paper was immediately air dried, placed in a sealed plastic bag and stored at room temperature. All malaria cases were treated as per the national guidelines for malaria treatment of each country. A of total 135 samples (Laos, 110; Vietnam, 25) were used for PCR analysis (Table 2). DNA was extracted from dried blood samples on filter paper, and subsequent PCR analysis was carried out as previously described [14, 15]. Briefly, each dried blood spot was cut into small pieces by a razor blade. The razor blade was cleaned with alcohol wipes and flamed at every sample cut to prevent contamination and to inactivate DNase. gDNA was extracted using a QIAamp DNA micro kit (QIAGEN, Tokyo, Japan). Plasmodium species-specific nested PCR assays to identify human, and P. knowlesi were performed as described . The genus-specific primers, rPLU-1/rPLU-5, were used in the primary amplification (nest 1) and performed as described by Singh et al. (1999) . Detection of species-specific 18S rRNA genes (nest 2) was performed as previously described [5, 15, 16]. For the nest 2, 2 μL of × 50 nest 1 amplification product was used as the template in the reaction mixtures (25 μL). PCR products were separated by electrophoresis on 1.5% agarose gels and stained with ethidium bromide. DNA bands were analysed with Lane & Spot Analyzer software (Atto, Tokyo, Japan). For the detection of the P. knowlesi 18S rRNA gene, two kinds of primer sets, pmk8/pmk9  and Kn1f/Kn3r , were used. It is known that the primer set Pmk8/Pmk9 can occasionally cross-react with P. vivax DNA and produce false-positive results whereas primer set Kn1f /Kn3r does not (Additional file 1). For confirmation of P. knowlesi infection, detection of the P. knowlesi circumsporozoite protein (CSP) gene was carried out as previously described by Vythilingam et al. (2008) . Primer sequences for 18S rRNA of human malaria parasites and P. knowlesi-specific primers and the CSP gene of P. knowlesi were as previously described [5, 15–17]. P. knowlesi H strain DNA (American Type Culture Collection no. 30158) was used as a positive control. We verified that no cross-reaction occurred between the primer sets used to amplify P. vivax CSP and P. knowlesi CSP by using DNA extracted from single infections of both species (data not shown). A sample was only considered positive for P. knowlesi if all three assays (pmk8/pmk9, Kn1f/Kn3r and PkCSP) gave a positive result. For nucleotide sequencing, the specific products resulting from PCR amplification of the CSP and 18S rRNA genes were cleaned using the Wizard SV Gel and PCR Clean-up System (Promega, Tokyo, Japan) according to the manufacturer’s instructions and were then sequenced with the BigDye Terminator v3.1 Cycle Sequencing Premix Kit (Applied Biosystems, Inc.). The reaction products for sequencing were separated with an ABI/Hitachi 3130 × 1 Genetic Analyzer (ABI), and the resulting nucleotide sequences were compiled using Genetyx (Genetyx Corporation, Tokyo, Japan). In Laos, 1256 persons were recruited for microscopic blood examination, of which 63 (5%) were positive for malaria parasites, 30 for Plasmodium falciparum and 32 for Plasmodium vivax with one mixed infection (P. falciparum + P. vivax) (Table 1). Parasite prevalence was highest in the southern part of the study area, and children under 15 years old were significantly more likely to carry parasites than adults. Of 63 malaria positive cases, 35 samples were available for molecular screening of P. knowlesi and human malaria parasites (Table 2). In order to thoroughly screen for P. knowlesi, 75 slide-negative samples collected from family members of microscopy positive patients were also screened. Plasmodium knowlesi infection was assayed using three PCRs, two based on the 18S rRNA gene and one on the CSP gene. Only samples positive for all three assays were considered to be P. knowlesi positive (Additional file 1). Nine out of 110 samples were positive for P. knowlesi (Table 2). Six were detected among the 35 microscopic positive samples (17%) and three cases among the three microscopic negative samples (3%). Plasmodium knowlesi was exclusively detected in samples collected from children aged 2 to 10 years old and was always found in co-infection with either P. falciparum or P. vivax (Table 3). In two cases, we observed P. knowlesi infection of two family members simultaneously: cases 3 and 4, and cases 8 and 9 were infections of brothers in the same families (Table 3). In Vietnam, of 1803 persons recruited for microscopic blood examination, and 35 (2%) were positive for malaria parasites. Of these, 18 were infected with P. falciparum, 14 with P. vivax, and one with a P. falciparum + P. vivax mixed infection (Table 1). Malaria prevalence was highest in the southern villages, as in Laos. Of the 35 microscopic positive cases, 25 blood samples were available for PCR analysis for the identification of Plasmodium spp. Three out of these 25 samples (12%) were positive for P. knowlesi, all in co-infections with P. vivax (Table 2). Molecular diagnosis of P. knowlesi was performed by the independent amplification of two genes (18S rRNA and csp), and PCR products were sequenced for confirmation of diagnosis. This molecular diagnosis was carried out independently at three separate institutions. Twelve out of 135 samples examined by PCR were confirmed as P. knowlesi through sequencing of the CSP and 18S rRNA gene (Fig. 1 and Additional file 2). All the P. knowlesi parasites detected in this study were found in co-infections with P. vivax, either in dual-species infections or (but only in Laos) triple-species infections along with P. falciparum and P. vivax (Table 2). We did not detect any dual infections of P. knowlesi with P. falciparum (Table 2), and similar findings have been previously reported in Vietnam . No single P. knowlesi infections were found in this study, although a single P. knowlesi infection case was recently reported from Attapeu province (adjacent to Cambodia), Laos . All the P. knowlesi infections in this study were detected in children under 15 years old. In contrast, infection with human malaria parasites often occurred in people older than 15 (Tables 2 and 3), and a similar tendency was reported in Southern Vietnam . This may be a consequence of age-related acquired immunity against the parasites, as well as the fact that our analysis was skewed towards children . The body temperature of children carrying P. knowlesi was normal except cases 1 and 5 (Table 3), although the cyclical nature of malarial fever means that the timing of temperature monitoring is crucial, and it is possible that fever episodes in these individuals were missed. The asymptomatic presentation of P. knowlesi infection described here differs from the symptomatic infections observed in Malaysia, where individuals infected with P. knowlesi suffer malaria disease and occasionally develop severe illness . It is possible that this difference is a consequence of the fact that P. knowlesi was only found in co-infections with P. vivax in our study. Other factors that could contribute to this difference include the genetics of the parasites and their hosts, and transmission intensities. It is known that M. fascucularis and M. nemestrina are natural hosts of multiple species of non-human primate malaria parasites [5, 19–21]. These macaques are present in the study area [20, 21] where Anopheles dirus and Anopheles minimus, known vectors of P. knowlesi [3, 10, 11, 22], have previously been captured . The presence of monkey reservoirs and competent mosquito vectors is consistent with the hypothesis that P. knowlesi infection of humans here is a zoonotic phenomenon, although human-human transmission cannot be excluded. 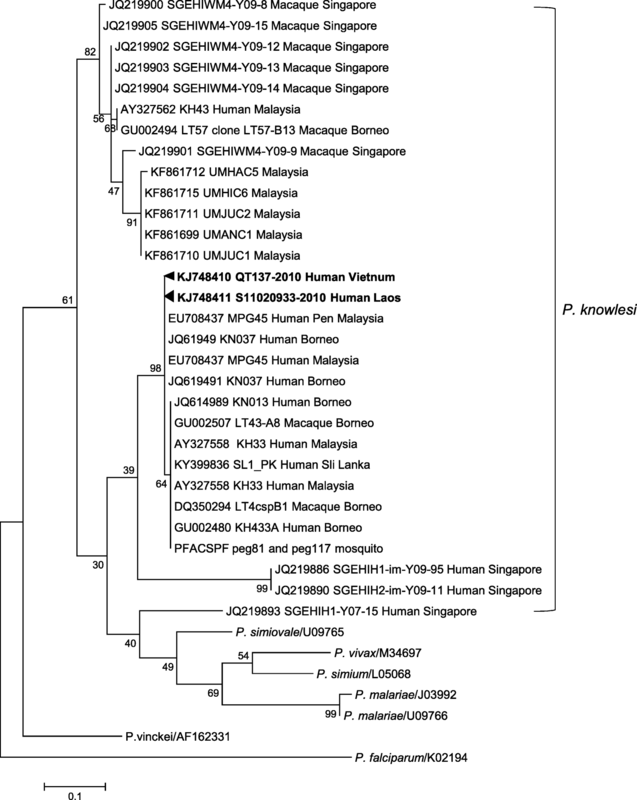 This molecular epidemiological study describes the presence of multiple natural human infections of P. knowlesi in Laos. We also report that P. knowlesi is transmitted on both sides of the Vietnam-Laos border—although the villages are so near to each other that it would have been odd if it occurred only the one side of the river. Although P. knowlesi has not been widely reported in Southeast Asia, it has the potential to cause severe disease in humans, and so, its prevalence should be closely monitored . Furthermore, as humans continue to encroach into previously uninhabited regions, and contact between monkey, mosquito and human populations becomes more frequent, P. knowlesi and, potentially, other macaque malaria parasite species, have the potential to become more prevalent in the human population. Therefore, continued monitoring of the range and prevalence of P. knowlesi is of importance to the National Malaria Control Programmes of both countries. We appreciate the support of the staff of Preventive Medicine Center Quang Tri Province, Vietnam, and Savannakhet Provincial Malaria Station, Laos, and local authorities, and thank the volunteers who participated in this study. This study was partly supported by the following four grants: (i) the Japan Society for the Promotion of Science (JSPS) Asia Africa Science Platform Program; (ii) JSPS KAKENHI grant number 23406022; (iii) the Cooperative Research Grants from Joint Usage/Research Centre on Tropical Disease, Institute of Tropical Medicine, Nagasaki University (2011-Ippan-7); and (iv) the RINH project and the Medical Committee Netherlands-Vietnam (MCNV) in collaboration with the Savannakhet and Quang Tri provincial health department. The data supporting the conclusions of this article are included within the article. Nucleotide sequences generated in this work have been deposited at GenBank. GenBank accession numbers are KJ748410 for Vietnam 137 (Hu-QT137-2010-Vietnam) as representative Vietnam specimen and KJ748411 for Laos 933 (Hu-S11020933-2010-Laos) as representative Laos specimen. TP, HH, LT, PP, RPM and KM conceived and designed the study. TP, HH, LT, PP, RPM and KM performed the field work and data collection. YM, TP, HH, RPM, RC, SK and SN performed the experiments. YM, TP, HH, RPM, RC, SK and SN performed the statistical analysis. TP, YM, RC, SK, RPM, SN, HH, LT, PP and KM wrote the paper. All authors read and approved the final manuscript. The study was reviewed and approved by the research ethics committee of the Provincial Health Department of Savannakhet and the Provincial Health Department of Quang Tri. Human sample analysis was approved by the ethics committee, Institute of Tropical Medicine, Nagasaki University (10121662-5). All adult volunteers provided informed consent, and for children, consent was obtained from close relatives. Nakazawa S, Marchand RP, Quang NT, Culleton R, Manh ND, Maeno Y. Anophles dirus co-infection with human and monkey malaria parasites in Vietnam. Int J Parasitol. 2009. https://doi.org/10.1016/jipara.2009.08.005. Trung HD, Bortel WV, Sochantha T, et al. Malaria transmission and major malaria vectors in different geographical areas of South East Asia. Trop Med Int Health. 2004; doi:org/https://doi.org/10.1111/j.1365-3156.2004.01378. x.
Zhang X, Kadir KA, Quintanilla-Zariñan LF, Villano J, Houghton P, Du H, Singh B, Smith DG. Distribution and prevalence of malaria parasites among long-tailed macaques (Macaca fascicularis) in regional populations across Southeast Asia. Malar J. 2016. https://doi.org/10.1186/s12936-016-1494-0.